Indonesia is the six largest country with more than 230 million peoples. 30 million of them live all over Indonesia big city such as Jakarta,Bandung and Surabaya, make java island where those big city are is the most crowded island. If you think mass trasportation in Indonesia is like bus or train and taxi, then you an epic failed. Those mass transporation couldnt handle the overpopulation in big city and so there others type of mass transport yang peoples common use everyday. Angkot stand for angkutan perkotaan (city transport) basicly angkot is an car usually a mini bus that already been modifed with no regular car seat. So passenger sit face to face like their on a train, angkot is the most common and wide spread mass transport in Indonesia big city. Every big city make their angkot with a costumize signature for every destination such as colour or number, so you have to remember this to avoid get in to the wrong destination. Their nothing luxury about angkot, no air conditioner or what ever it is. Driver usually take more passenger than the car could afford to fit in. Lucky this stupid mass transportation is legal, so goverment who decide the rate and ussually you have to pay the same amount for both long and short distance. Angkot in big city not always save, expecially at night. Theres a lot of robbery and rappist inside angkot, get in to angkot in the middle of the night alone and being a women tourist is sunicide. Ojeg will deliver you everywhere! Yes everywhere! But first you gotta deal the rate first, carefully ojeg drivers usually will put a high rate, you must good at dealing the rate. Ojeg driver also know love to scam the passenger by telling them lies, that the destination are far away. Ojeg driver will take you round and round in the city before arrive in you destination, make you felt worth it to pay that much. Gojeg stand for ojeg on-line. This is the same thing with ojeg but its legal. And you must download gojek apps for calling gojek driver, if you familiar with uber then its is the same stuff but not a car, its a motorcycle. 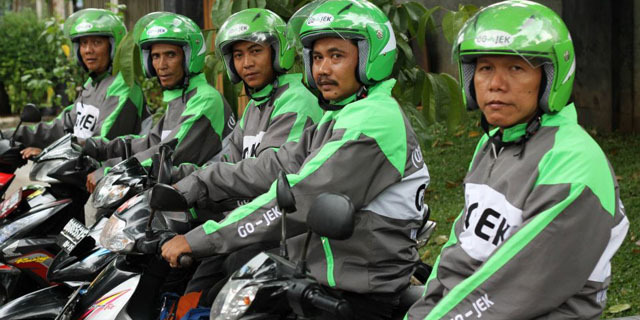 The best part of gojek is, you dont have to look for ojek and you dont have dealing the rate with the driver. Everything is on the apps, how many gojek driver in you area and easy to know how much you must pay for certain distance. So you wont get fool like by the ordinary ojeg driver. Ok, you might ask if there any bus or train and off course a taxi? Yes there are in each of big city. But remember those mass transportation allready dominate by middle class peoples, so 9-5 office hour every mass transport like bus, train and taxi will crowded by this cubicle worker. And there no chance you will enjoy the ride beside the crowded there also the insanely traffic jam. Wanna stuck for hours inside bus, train and taxi with no space to move your toe? haha, gojek dan ojek cuma beda dikit.